Tiramisu is an easy dessert to make and loved by everyone who tastes it. It’s a soft dessert rich in flavor thanks to the coffee and coffee liqueur infused into it. The Senior Coffee Liqueur perfectly complements the flavor due to its deep coffee taste. The tiramisu has to be refrigerated before serving, so it’s the perfect dessert to make when you’re hosting a dinner party. You can make it ahead of time, so you have more time to enjoy the company of your guests. 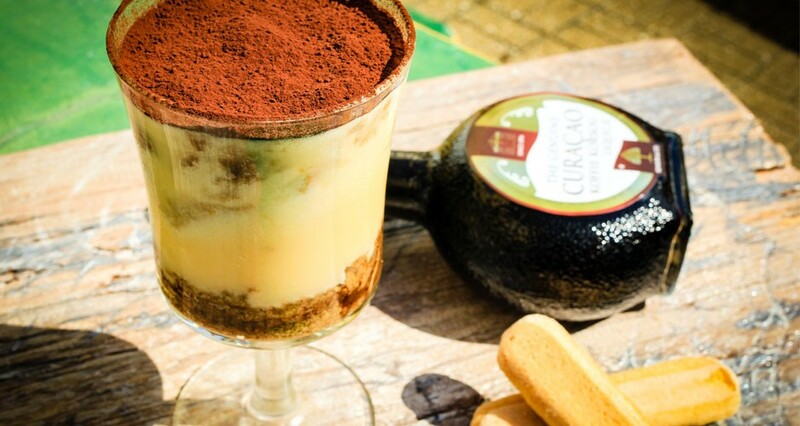 Build the tiramisu in a beautiful glass to make it even more impressive. But, be careful not to eat all of it beforehand. Beat the whipped cream stiff with a tablespoon of sugar. In a bowl, beat the egg yolks with the rest of the sugar and mix the mascarpone into it. With a spatula fold the whipped cream into the mascarpone mixture. Mix the espresso with the Senior Coffee Liqueur in the small glass roaster. Dip the ladyfingers one by one into the espresso mixture. If you are serving the tiramisu in glasses then break the ladyfinger into pieces and layer them on the bottom of the glass. Add a layer of the mascarpone mixture and then repeat the process. Layer all serving glasses. If you will use the glass roaster to serve then divide the ladyfingers over the bottom of the glass roaster. Cover the ladyfingers with half of the mascarpone mixture and repeat this again. Let the tiramisu sit in the fridge for about 1 hour. Dust the tiramisu (glass and roaster) with cocoa powder using the sieve before serving.